Are you looking for a watch that can help monitor your heart rate? 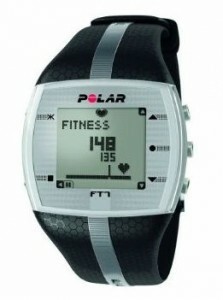 The Polar FT7 Heart Rate Monitor is one of the best watches on the market. The Polar FT7 Heart Rate Monitor will help you reach your fitness goals, whether it’s burning fat, or training for a marathon. With Smart Coaching features such as EnergyPointer and Smart Calories, this heart rate monitor provides plenty of tools to help you improve your health. An easy-to-use feature, EnergyPointer, visually allows you to see when you’ve crossed over from the fat burning zone (low intensity) into the fitness zone (high intensity) rates. By measuring your heart rate and the variability of your heart rate, the online program combined with your personal information of fitness level, age, height, weight, gender, and maximum heart rate, calculates your EnergyPointer. Keeping track of calories expended during a workout is easy with OwnCal, the market’s most accurate calorie counter to date. Using your maximum heart rate, age, weight, height, gender, and intensity of workout, the calories expended during your workouts are easily displayed. The Polar FT7 Heart Rate Monitor has a comfortable fabric transmitter, as well as a specially coded heart rate transmitter, to avoid cross-talk interference. Body measurements that can be recorded include average and maximum heart rate of training, total beats per minute and your heart rate percentage, your maximum heart rate, your target zone (beats per minute), the Polar EnergyPointer, Polar OwnCal® (calorie expenditure), and Polar OwnCode® (coded transmission). The watch features include: a 12 or 24 hour display; backlight; date and weekday indicator; dual time zone; KeyLock, which keeps training information safe; low battery indicator; multiple language options including English and Spanish; visible and audible alarm with snooze options; water resistant to 30m; and, user replaceable battery. Other features this Polar Heart Rate Monitor include: the ability to transfer data, which work with both Mac and PC, through Polar FlowLink; Polarpersonaltrainer.com features such as training analyzing, training diary, training program, and training load; recording features such as totals, weekly history, and training files, with summaries; and, training features, such as target zones in a graphical format, and HeartTouch, button-free operation of your wrist unit. Battery type is CR1632 and the battery life is one year. The Polar FT7 Heart Rate Monitor comes with a Manufacturer’s Warranty of two years.